Fun fact about me: I really love Halloween! I’ve always been a huge fan of Halloween since I was a little kid. Growing up my mother always decorated our house for halloween, watched scary movies with us, and made DIYing our costumes so much fun. Since I’m a creative person, I’ve always been drawn to this holiday because I can really let my imagination run wild. When it comes to Halloween decor I’m not a huge fan of the tacky bright orange “chachkies” that are widely available. This year I challenged myself to source pieces that fit my style, was chic, and didn’t cost an arm and a leg. I consider myself a minimalist so I never want decorations of any kind to take over our space or make it feel cluttered. However, I always want our home to be in the holiday spirit for our family! I gave myself a budget of no more than $50 to add decorations to our shelf and I ended up spending $35 total! We don’t have much storage space so I didn’t want to buy a bunch of random things and have nowhere to put them. I utilized a lot of decor we already had (i.e candle stick holders, vintage books, candle holder, and trinket box) which made my life so much easier. 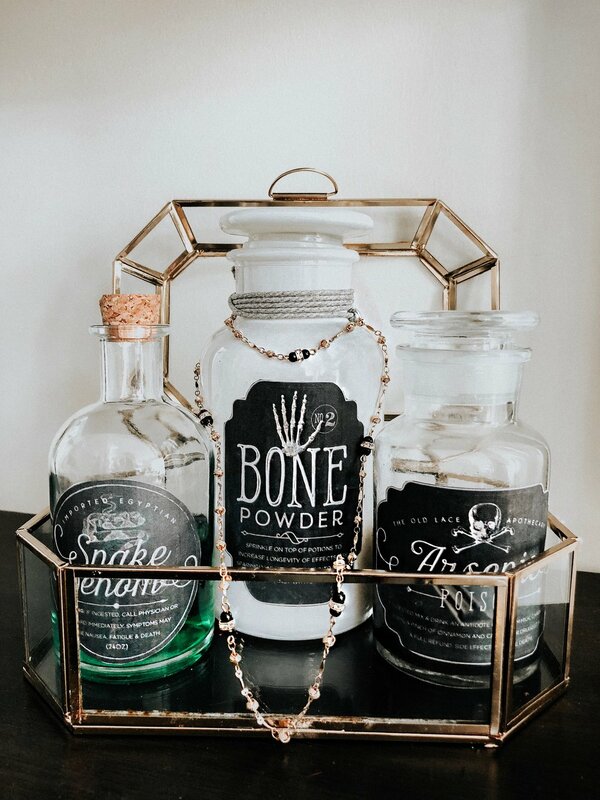 I also did a super cute haunted apothecary DIY which was crazy simple and took me all of 10 minutes to do (find the tutorial here). How are you decorating for Halloween? Leave a comment below!